Godrej Office Chair online with Price, Manufacturers, Suppliers, Traders and Companies in India. DIVA PCH-7046ADiva range is ergonomically and flawlessly designed on the principles of human engineering, to maximize efficiency through comfort in a demanding work environment. The chairs have a characteristic flexi-back that flexes naturally as you recline, without any adjustment mechanism, for maximum comfort and relief. Even when upright, it lends constant and proper support to your back. The Godrej High Back Chair provided by us is known for ts lightweight design and durability. This chair is available to clients at budget friendly market prices. It is unbreakable. 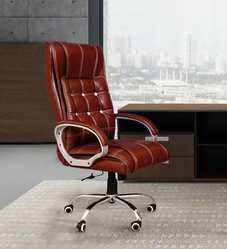 We are providing office chair of Godrej brand.